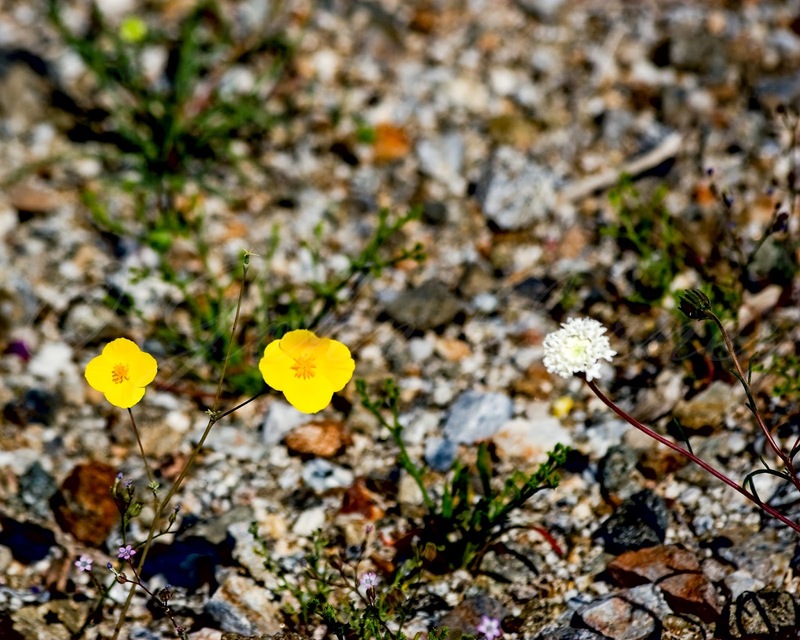 This cluster of wildflowers is typical of the flowers in Plum Canyon in Anza-Borrego Desert this spring. 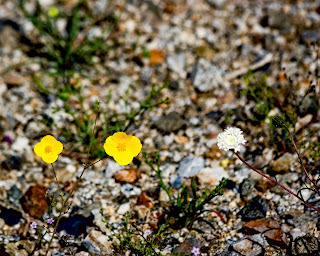 Because of the dry and harsh environment, most of the flowers are tiny like the three in this photo. But what they lack in size, they make up for in color. It's pretty difficult to try and identify all these flowers, but I'm pretty sure the white one is Desert Pincushion. Help out if you can. I've been using the CalFlora.org website to try and identify the flowers in this series. do you know the name of the yellow flowers in this photo? I have a shot (not as nice as yours) of similar flowers that I found at the top of Enchanted Rock in Texas. It is amazing to me that they can find enough soil and nutrients to grow in cracks and fissures in the granite. Thanks for posting your photos. As always, I appreciate your work and aspire to your level of expertise! I actually spent quite some time going through the extensive database of flowers at calflora.org, but there are so many yellow flowers that look similar to this one that I just didn't dare to hazard a guess at it fearing that for sure I'd get it wrong. I took a look at the flowers you referred to on your blog, but I would say they are definitely a different flower just from the count of petals there are on each flower. Thanks for keeping an eye on my photos and for your kind comments. You're right, I went back to my shot and the flowers are different. To be expected I suppose since we're in different parts of the country. Thanks for visiting my 'blog, though. I am always grateful for visitors.